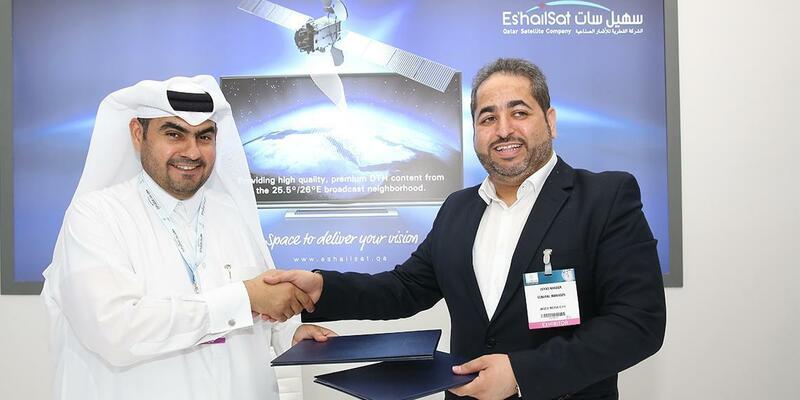 Es'hailSat, the Qatar Satellite Company and JASCO Media City announced the signing of framework agreement to launch a new MCPC platform to support the growing broadcast market in the Middle East. Under the terms of the agreement JASCO will provide bundled services including playout, compression and uplink together with satellite bandwidth on Es'hailSat Satellite. Operating from the MENA broadcast hotspot of 25.5° E / 26° E, covering key consumer markets in GCC and North Africa, Es'hailSat's high powered satellites provide the key infrastructure to media networks and broadcasters to distribute TV channels directly to consumers via small satellite dish. Customers are able to leverage on Es'hailSat's satellites to provide services such as linear TV, video on demand, high definition TV and 4K TV among others. JASCO Media City based in the Free Zone in Na'ur, Jordan is a teleport operator providing satellite TV and radio consultation, channel operations including playout, montage and graphics services, studio operations and satellite capacity management. Es'hailSat's President & CEO, Ali Ahmed Al Kuwari said: "We are delighted to open another channel bouquet on our satellite to support the dynamic broadcast market in MENA. We work with value added resellers and partners to support the MENA broadcast customer's current and future requirements and cooperation such as this one with JASCO Media City which will benefit the industry in general." JASCO Media City's CEO, Dr. Zeyad Khader said: "It is a pleasure to work with an established and innovative satellite operator like Es'hailSat to offer our broadcast services. Our agreement with Es'hailSat enables us to provide an end-to-end solution to customers in the region, from our teleport in Jordan for services like playout and uplink combined with Es'hailSat satellite capacity."